Chirotables.com has just updated consignment chiropractic tables section of our web site. To purchase any of the consigned chiropractic tables, simply call us toll-free at 1-800-553-0057. With pricing like this, these tables won't last long! Features: Please call us at 800-553-0057 for a complete list of features for this consignment table. Pricing: Please call us at 800-553-0057 for pricing information! Features: Manual dual cervical drops, Auto chest, lumbar and pelvic drops, manual flexion, height select and T-bar. 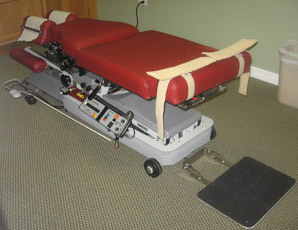 Chiropractic Table: Lloyd Galaxy 900 H.S. Features: Manual dual cervical drops, auto chest, lumbar and pelvic drops and spring breakaway. All prices on Chirotables.com are subject to change without notice. Please call us for up-to-the-minute chiropractic table availability.